Do you need dialysis treatment while you are visiting Berlin? 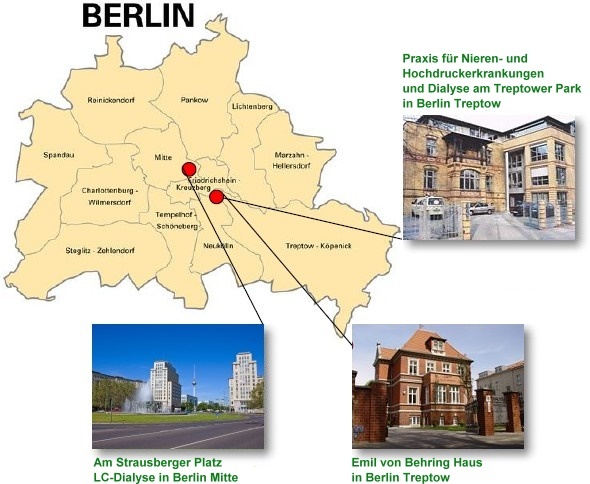 We offer guest dialysis sessions in our 3 locations in Berlin: Our main office Dialyse am Treptower Park and the Dialyse im Emil von Behring Haus are located close to the “Molekul Man Sculpture”, where three districts of Berlin meet each other: green “Treptow”, multicultural “Kreuzberg” and hip “Friedrichshain”. Our LC-Dialysis Dialyse am Strausberger Platz is located in the center of Berlin in the district “Mitte”. It is very close to Alexander Place. If you have special time and location preferences, we will try to consider them. To organize transports between our dialysis center and your accommodation is no problem, just let us know. We also provide a holiday flat (vacation rental) right next to the dialysis center. The flat can be used for a maximum of three persons and has everything you need for your stay. An elevator and an underground car park make it usable for people with a wheelchair. 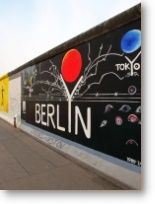 The Berlin Wall and the famous “East-Side-Gallery“ are very close. Food stores, bus and train stations are within walking distances.